Trample At the beginning of your upkeep, sacrifice Lim-Dul's Paladin unless you discard a card. If you sacrifice it this way, draw a card. 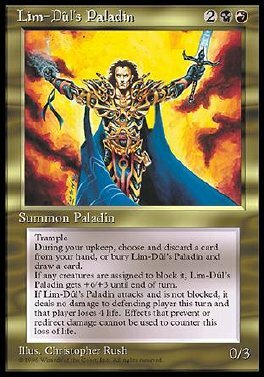 Whenever Lim-Dul's Paladin becomes blocked, it gets +6/+3 until end of turn. Whenever Lim-Dul's Paladin attacks and isn't blocked, it deals no combat damage this turn and defending player loses 4 life.